I’ve been thinking about the little music player I made a while back – the idea was a specific RFID tag triggers a specific album or track to play on an mp3 program. It worked, as a proof-of-concept, but I never built it out into a practical daily-use system. My new thought is to break it into two pieces – a tag reader component, and a DAC music player. They would both connect to the same local WiFi network and communicate using web APIs. Breaking it into two components allows each to focus on a specific task – one as strictly a tag reader (and track controls) and one to focus on playing mp3 files to an audio receiver. The tag reader portion can be small, battery-powered, and therefore portable. The tag reader portion will be a low-power Arduino chip connected over I2C to an RFID board. The Arduino will also need WiFi, perhaps an Adafruit Feather system. 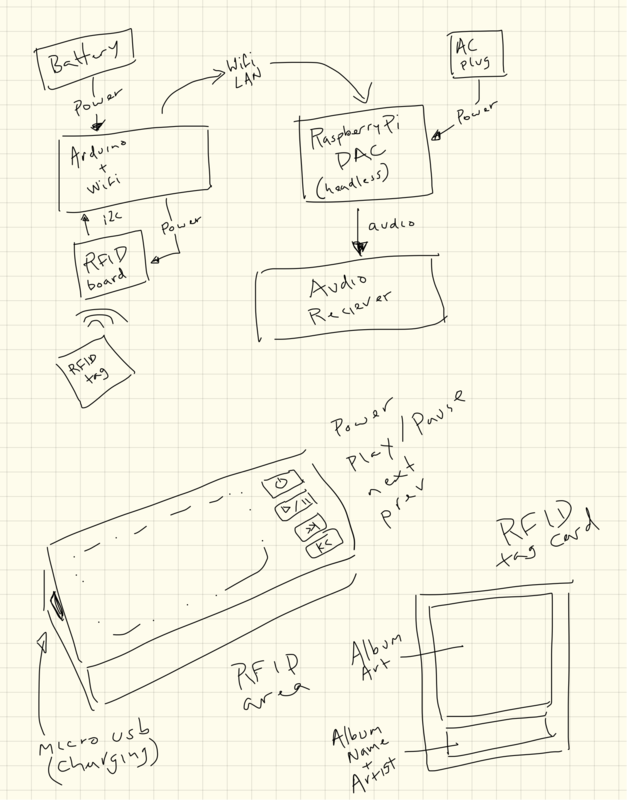 The player portion will be a Raspberry Pi, possibly with a DAC board for higher-quality audio output. It will run a dedicated headless audio solution such as RuneAudio or Volumio. Music will be stored on SD card or possibly HD, depending on size of library. I could also possibly connect it to the music server I have set up on the network as a source.